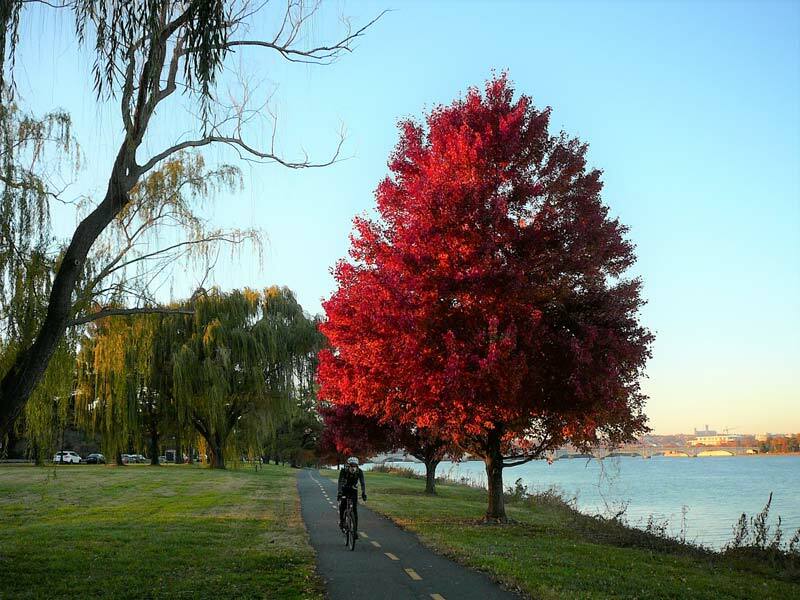 Swap the treadmill and head outdoors to one of DC’s many scenic running paths and trails. When Pierre Charles L’Enfant laid out the city plans for the nation's capital, he included wide avenues, public squares and grand buildings. The District is also mostly flat and home to many trees, rivers, creeks and canals, making the city a runner’s dream. It's time to pound the pavement on these scenic places to run. All runners should clock some miles on the National Mall. Not only is jogging past grand monuments, memorials and museums a truly unique DC experience, there are other benefits: the Mall is mostly car-free and the paths and monuments are illuminated at night. Looking to get your sweat on and learn about some of America's most iconic sites? 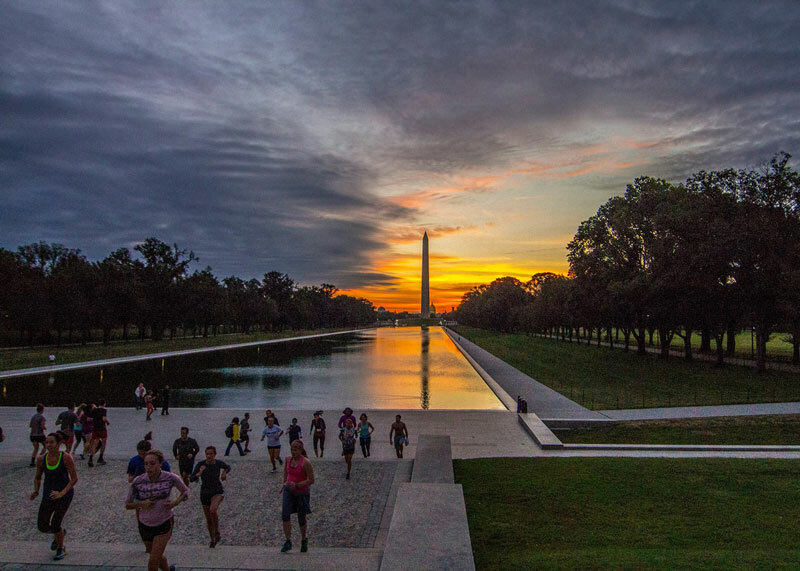 Meet a National Park Service ranger by the Washington Monument Lodge for a free Ranger Run – check their events calendar for more information. The Chesapeake & Ohio Canal's history begins with George Washington’s recommendation to build waterways connecting the Eastern seaboard with the Great Lakes and the Ohio River. You won’t see anyone transporting hogs, salt or whiskey on the C&O Canal these days, though you are likely to see plenty of joggers taking advantage of the soft dirt surface and shady path. The track starts in Georgetown and stretches 184.5 miles – though most runners stay within District borders. Between the Lincoln Memorial and the Potomac River lies a set of grand steps that seemingly lead to nowhere. The Watergate Steps were originally built to provide an impressive entrance for visiting dignitaries arriving in DC by boat. While that didn't take hold, the steps did provide the basis for the name of an infamous office block nearby, and a way for runners to build their stamina and endurance sprinting up the steps. 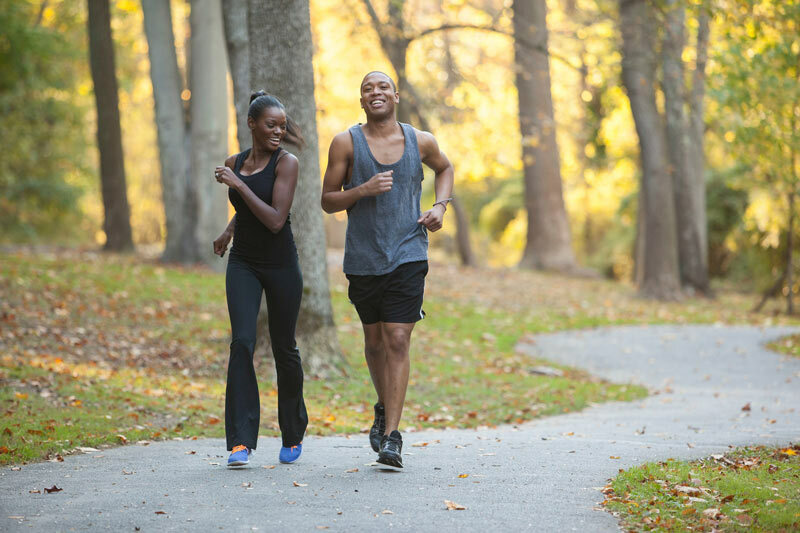 DC has the oldest and largest urban park in the national park system, so it’s not surprising that there are plenty of options for raising your heart rate in Rock Creek Park. Runners can stick to the paved paths, head off-road on the extensive trail network or take advantage of a car-free Beach Drive when sections are closed to traffic on weekends. Hains Point is part of East Potomac Park, a man-made island surrounded by the Tidal Basin, Potomac River and Washington Channel. The green space attracts recreation seekers of all kinds with tennis courts, a golf course, plenty of parkland for social sports and a shoreline for fishing. A loop of roughly three miles takes runners to Hains Point at the tip of the peninsula and back. 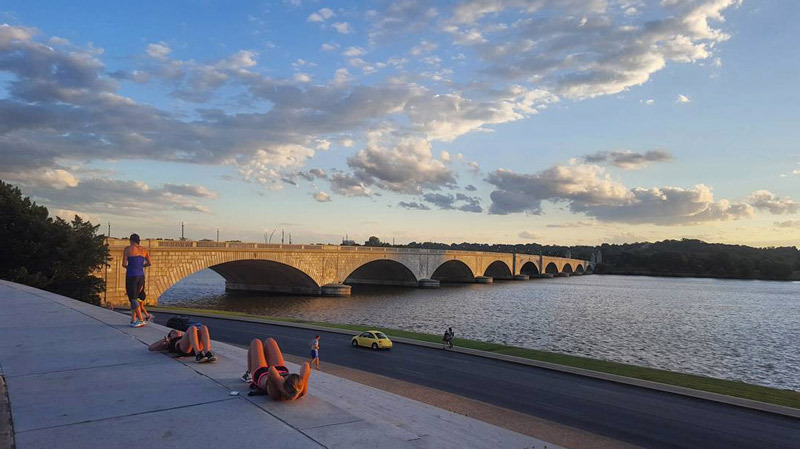 The southeast pocket of DC has undergone significant development in recent years, including a continuous 20-mile Anacostia Riverwalk Trail that runs along both sides of the river. Plan your route to include a cool down in the canal basin wading pool and riverside gardens in Yards Park on the Capitol Riverfront. 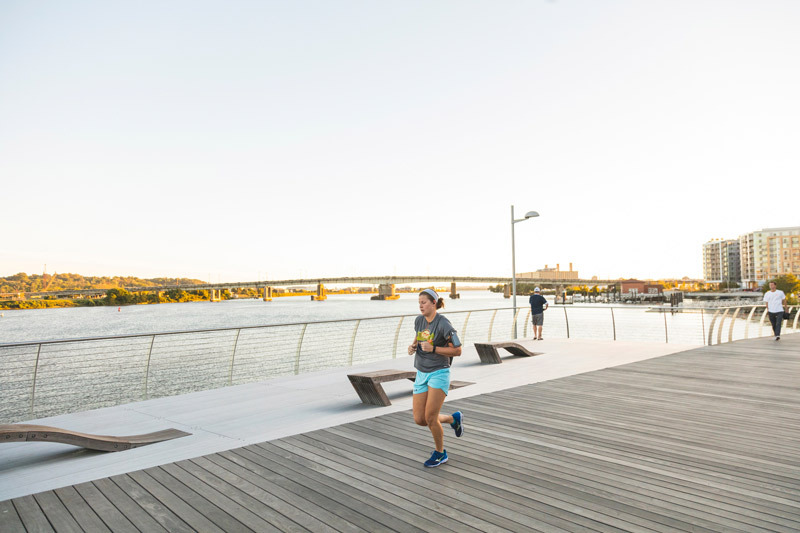 While there's a wide range of things to see and do in DC’s oldest neighborhood, runners will want to skip the cobblestone streets and high-end boutiques and opt for running trails and paths along the Potomac River. The Capital Crescent Trail, which is accessible from the waterfront, extends all the way into Bethesda, Md. What a run along Embassy Row loses in street crossings, it makes up for by passing some of the grandest, most historic homes in DC. The stretch of Massachusetts Avenue NW between Dupont Circle and the National Cathedral (on Wisconsin Avenue NW) takes runners past countless embassies, over Rock Creek Park and by the U.S. Naval Observatory – home to the vice president. "The Row" also provides a steady elevation gain for those who want to test their mettle uphill. If you think 446 acres of parkland sounds like a runner's paradise, you aren't wrong. 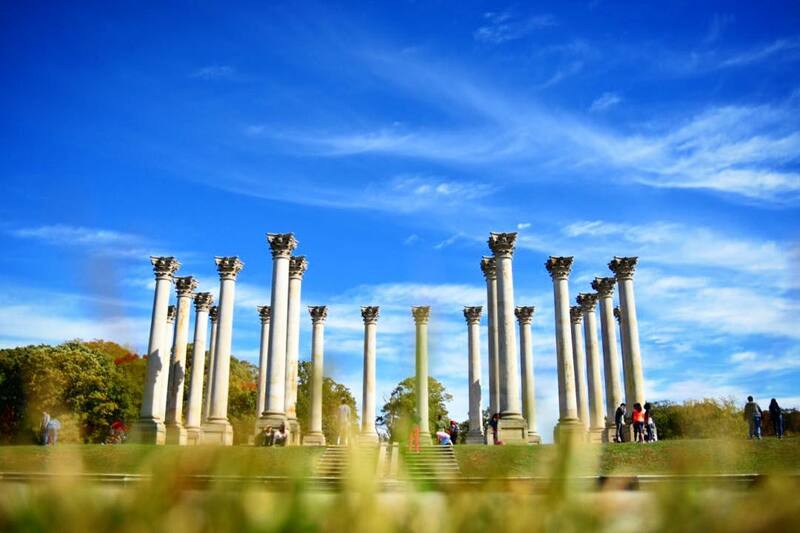 The federally funded National Arboretum has nearly 10 miles of trails with views that vary with the seasons. For an extra challenge, stretch the legs and lungs with a bolt up the 239-foot Mount Hamilton. The Arboretum is open daily from 8 a.m. – 5 p.m., with the exception of Christmas Day. The Mount Vernon Trail follows the Potomac River between Theodore Roosevelt Island and George Washington’s Mount Vernon. 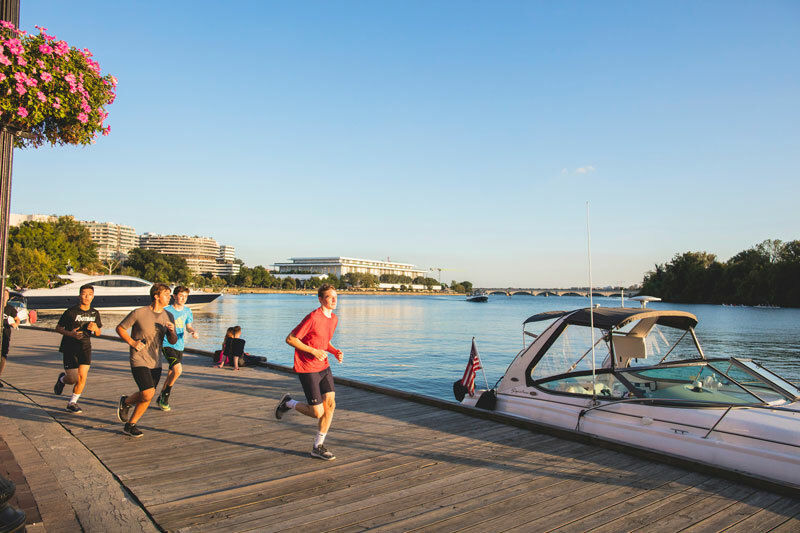 The 18-mile path has plenty of diversity to keep runners preoccupied, passing through wetlands, wooded areas, parks, yacht clubs and historic neighborhoods, such as Old Town Alexandria. DC has plenty of natural areas that will make you feel like you’ve left the city altogether. One such oasis is Glover Archbold Park, a stretch of forest running from Tenley Circle to the Potomac River in Georgetown. The pedestrian-only park is a favorite for trail runners who enjoy the abundant shade and encounters with wildlife such as deer and migratory birds. 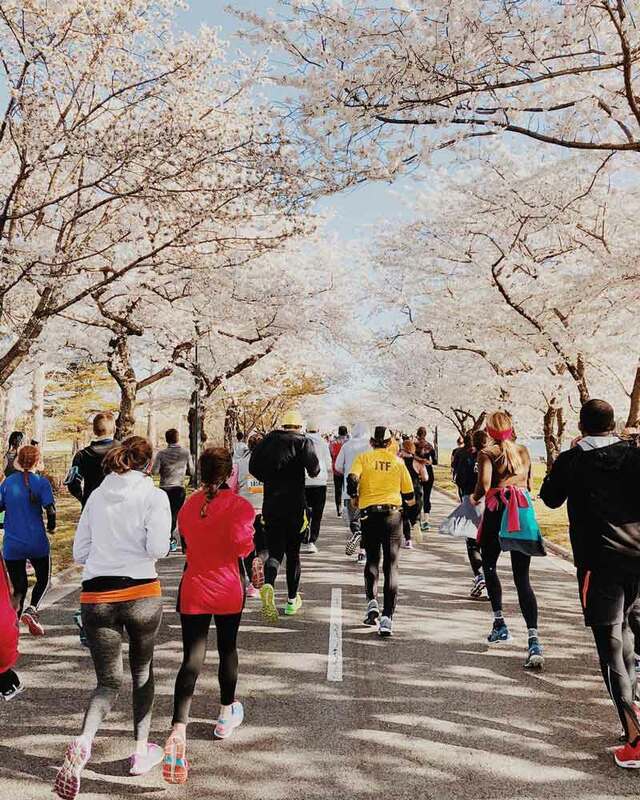 Turn your run into a training session and compete in one of these organized races and marathons in Washington, DC.